"The Parent-Infant Center (PIC) is a prevention and treatment program that provides multidisciplinary assessment and psychotherapeutic services to pregnant women and caregivers and their children from the ages of birth to three years old. The focus of treatment is on the child-caregiver relationship.The primary goal is to foster healthy attachments and strengthen relationships between caregivers and their children.Caregivers include pregnant women, mothers, fathers, teenage parents, grandparents, foster parents, adoptive parents and any other primary caregiver of very young children. The long term goals are to decrease the risk of child abuse and neglect and the ensure optimal mental health outcomes across the life span. "They rely heavily on donations for the families. 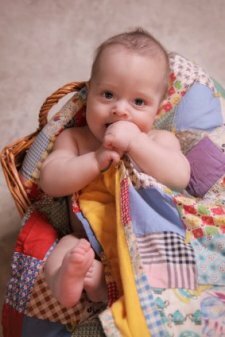 Here we are asking for quilts for the infants to 3 year old children, and quilts for the parents, who most often have very little." Give an infant a memory that will last. Donate today!